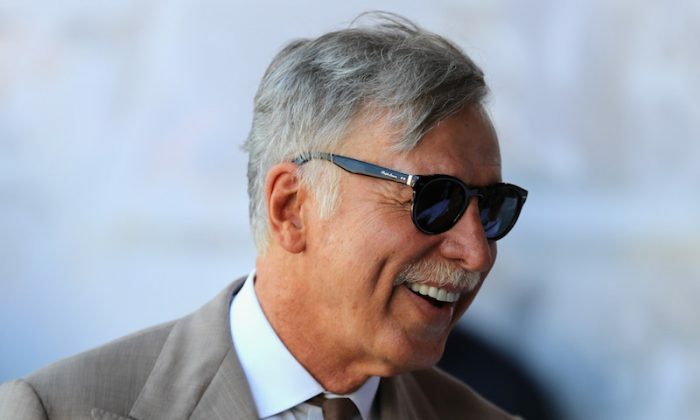 LONDON—American billionaire Stan Kroenke has struck a deal to take full control of Arsenal by buying out Russian rival Alisher Usmanov, valuing the English Premier League club at around $2.3 billion but enraging some fans of the north London team. Coming at a crucial time for Arsenal as they start life without manager Arsene Wenger for the first time in 22 years, the deal cements the position of the U.S. sports boss among an elite band of super-rich soccer club owners in England. Fans worry however that Kroenke, relying on a loan for the bulk of the funding, will not spend enough to compete for players with the likes of Chelsea, Manchester City or Paris St Germain, backed by money from Russia, the United Arab Emirates, and Qatar respectively. Kroenke, who largely avoids the media spotlight, owns a string of U.S. sports clubs including the U.S. Denver Nuggets basketball team, the Los Angeles Rams American Football team and the Colorado Rapids of Major League Soccer. Initially viewed with suspicion by the Arsenal board, the 71-year-old started building his stake in 2007 as he slowly bought out the families who had run the club for generations. He said on Aug. 7 he had now received an acceptance from Usmanov to buy his 30 percent stake, adding to the 67 percent he already owns. He will now buy out the remaining independent shareholders at 29,000 pounds for each of its rarely traded shares—more than the average salary for a British worker. “We appreciate Mr Usmanov’s dedication to the Arsenal Football Club and the storied ethos and history the club represents,” he said. Usmanov, ranked by Forbes as Russia’s 10th richest man with a fortune of $12.5 billion, owns stakes in some of Russia’s biggest companies including phone operator Megafon, iron ore producer Metalloinvest and Internet group Mail.ru. “I have decided to sell my shares in Arsenal Football Club which could be the best football club in the world,” Usmanov said in a brief statement. To buy him and the other investors out, Kroenke will pay 602 million pounds, using 45 million pounds of his own money and a 557 million pound loan from Deutsche Bank. In a world where clubs are owned by billionaires who do not always turn up to watch them play, the independent shareholders formed a rare bridge between the club’s board and its fans. Arsenal’s annual meeting was always a feisty affair. At the last game of last season, when Wenger stood down, some fans hired a plane with a banner saying “Kroenke—You’re next”. David Kershaw, an independent shareholder, fan, and CEO of advertising group M&C Saatchi, said he was concerned that the deal would not lead to a better performance on the pitch. “I think it’s very sad that we’re in danger of losing any transparency into how our club is run,” he said. His comments were echoed by Patrick Barnes, a shareholder who has been going to Arsenal since the 1970s to watch the likes of Liam Brady, Tony Adams, Dennis Bergkamp and Thierry Henry. “I’m disappointed it’s come to this, it was a strong way to connect to the club when you owned a piece of it,” he said. Kroenke now competes against the billionaire owners of other clubs such as Chelsea’s Roman Abramovich, Manchester United’s Glazer family and Sheikh Mansour bin Zayed al-Nahayan, who owns last season’s runaway winners, Manchester City. Arsenal fans have long complained that the club has not plowed enough money into the team. Americans have had a mixed fortune as Premier League owners, with the Glazer family rarely popular at Manchester United, even when the club won the league. Founded by workers at the Royal Arsenal armaments factory, the Arsenal team have claimed the League 13 times, including three under Wenger, and are FA Cup winners a record 13 times. New manager Unai Emery, who joined from Paris St Germain, will be given a baptism of fire this weekend when Arsenal kick off their new season against Manchester City.